Your first step in building an AI solution on platform starts with creating Projects. 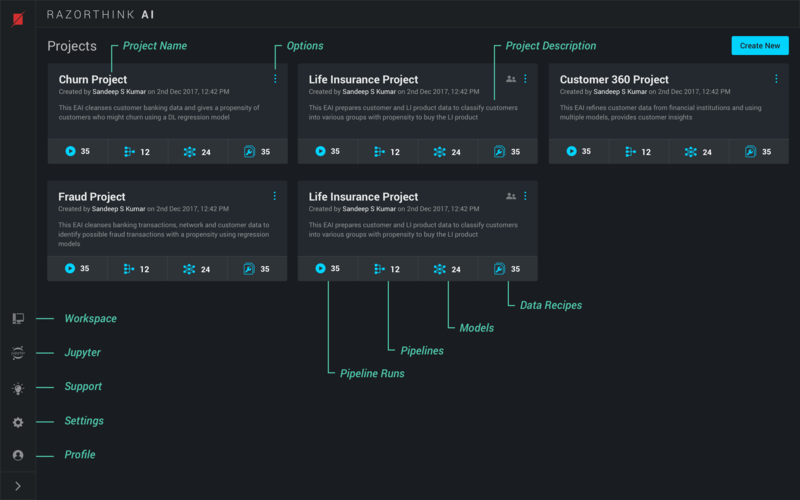 All your work like the data recipes, models and Pipelines sit inside this project. ​ By clicking on an Project card, you will be directed to the builder apps where you can access Pipeline builder, Recipe builder, Model Builder apps and Run explorer apps. You can create a Project by clicking on ‘Create New’ and providing the name and the optional description. Deploy option in the Project option menu, will let you deploy all the pipelines of the Project to the Engine (execution environment) of the platform. Delete option in the Project options menu will delete the Project along with all the components built in it i.e Recipes, Pipelines, DL Models etc.